It's such a shame to see almost all the political parties coming together to oppose Supreme court on an action which says criminals should not be allowed in Parliament. 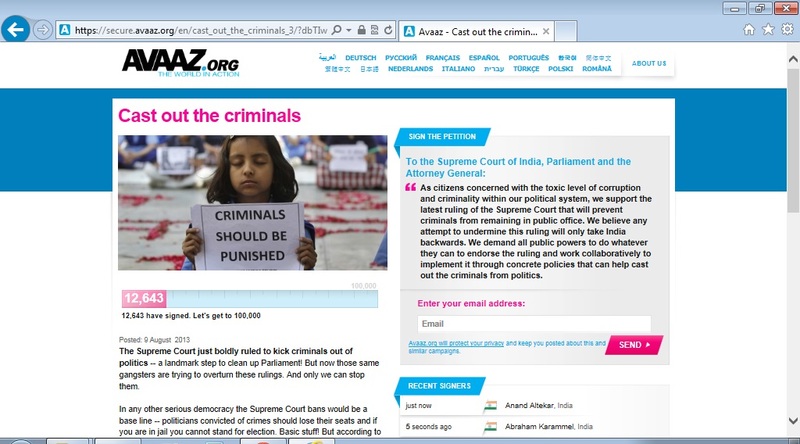 So, Avaaz.org has taken an initiative to help supreme court to take action against all the criminals and expel them out of Parliament by taking support of people. Common people of India, people like us are needed to help the initiative by just Signing Up the petition form. Form has nothing but one input box, which asks you your Email Id and then click on Send button and you are done with the petition form SignUp. Additionally you can share this petition form among your friends and circles and let them know about this petition and ask them to Sign Up. When to Sign Up for this petition? It's very urgent and we need to make this petition go work as AG's have counselled the criminals seating inside the parliament(which accounts around 30% of the total Member of Parliamentarians) that they can ask for amendments in the constitution to let them stay and be allowed to stand for elections as usual. How Avaaj.org can make a change through this petition? 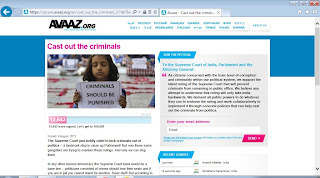 Avaaj.org has contacted all the three arms of the Government and has promised them to present a petition with majority going with the Supreme Courts ruling that is is to cast out the criminals of Parliament. So, if we in majority be able to Signup this petition form as soon as possible, Supreme court can stay on it's ruling and amendment in the constitution for allowing criminals inside the parliament can be revoked.